Now, whilst in Australia I have discovered that volunteering is a great way to do and see things that we don’t have the budget for. One such opportunity is for Music Festivals. I am a big fan of festivals and am a big music head. I have been going to Music Festivals since I was 14 and back in Reading, home to one of the greatest and legendary festivals in the world! Anyway, getting back on track an opportunity came up and I got a spot, Soundwave 2012, a one day Rock, Punk and Metal Festival in Sydney at the showground in Olympic Park. They wanted me! 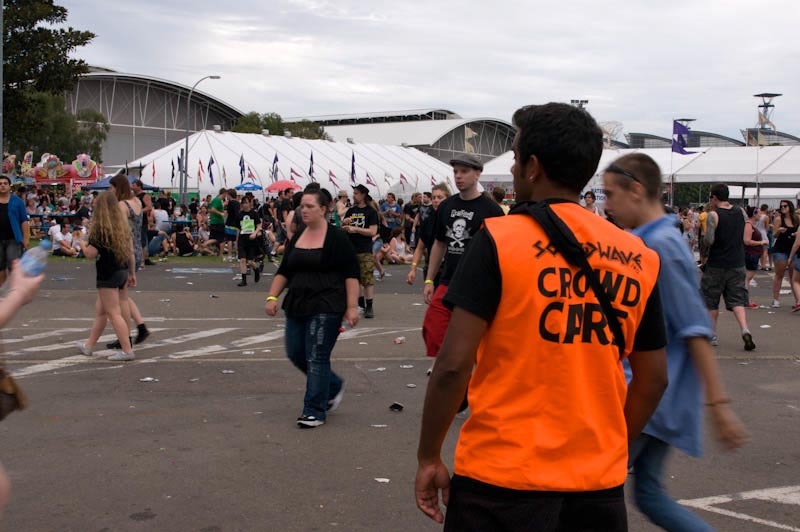 That’s right I was sought out for a very important role……Crowd Care! That’s right the folks at Soundwave gave me a spot caring for the 50,000+ Crowd for 4 hours, little old me and 50,000+ rockers, punks and metalheads! For those of you who don’t know my musical tastes, this was ok with me, the lineup was excellent and there were a few good bands that I wanted to see. I may not seem your average candidate for this festival, but inside this body is the heart of a rocker! So very early on Sunday Feb 26th, Steph drove me off to the venue to check in, this was not a event she fancied going to. She wondered why I was wearing all black for the day I just responded with a smirk, “I’m fitting in with my brothers and sisters for the day!” She laughed. The laughs were short lived as she dropped me off she was in awe of the “Goth Like kids” that appeared before her and not in a good way, I was in hysterics. Lets just say any child of ours who tries to dye their hair is in for a surprise! Once we were checked in I made a friend in Jonah a Sydneysider who originated from the Philippines but was an avid Punk, not of the colored Mohawk variety, but west coast style. We had a great conversation about music and we ended up spending most of the day seeing bands together. I also managed to swap my shift with a teenage girl who was itching to work with her friend at the EMO stage to see some teen boy EMO band, whatever!! But result for me as I had an afternoon shift which meant I could watch bands I wanted to! Happy days! When it came to shift time, we met up with the supervisor and he gave us our work for the day and uniform, that’s right I was presented with a bright orange workman vest, I felt like I was working on the roads! He also gave us our stages an jobs, My role was basically to point people in the right direction whilst wandering around the stages and if we saw any really drunk belligerent folks then we were to let security know, and its was noted not to do anything just let security know! What a job! Now Jonah and I teamed up and wandered together, to be fair our shift was fairly quiet. We were on during the afternoon, most folks had been here a while and had already orientated themselves between the bars and stages and it was not late enough in the day for the belligerent drunks to start appearing so we lucked out. We pointed a couple of folks to the toilets, a couple of Marilyn Manson look-a-likes to a stage and a few others to the bar; in the meantime we saw some great bands whilst in our fab orange vests, great for making your way through a crowd! Below is a snapshot of Fran “Crowd Care” Minien in action. The festival itself was a great opportunity to people watch, take some photographs and listen to some great music. 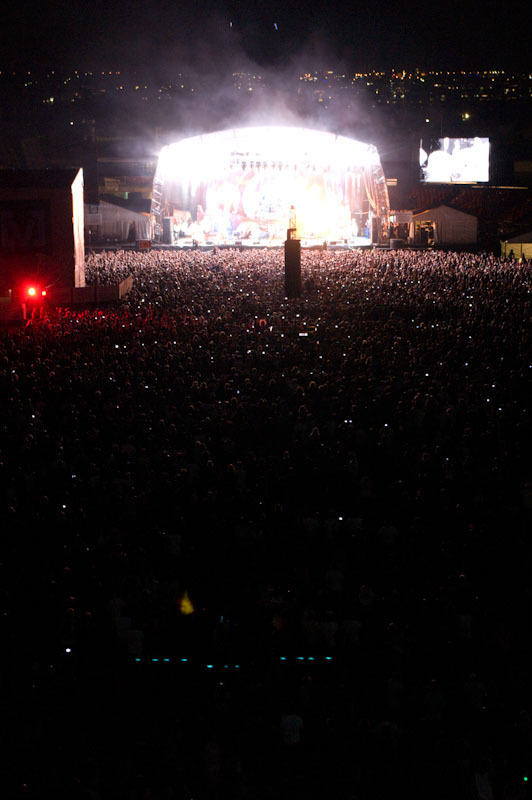 But more importantly it was about the Crowd and here are some photo’s of the crowd we cared for! !